Looking for a light lunch or dinner option? 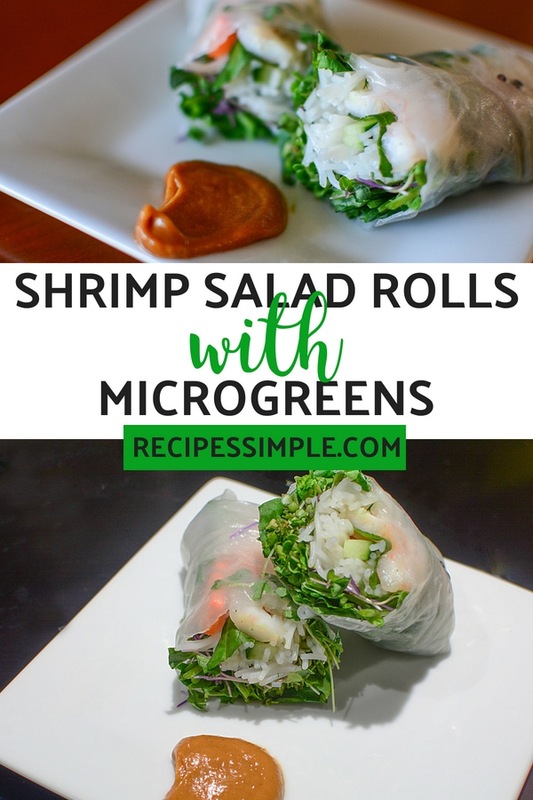 Try these refreshing shrimp salad rolls with microgreens, they are really easy to make and are a great way to incorporate more vegetables into your diet. You get the crunch from the veggies, tender noodles, perfectly cooked shrimp, paired with a tasty dipping sauce. 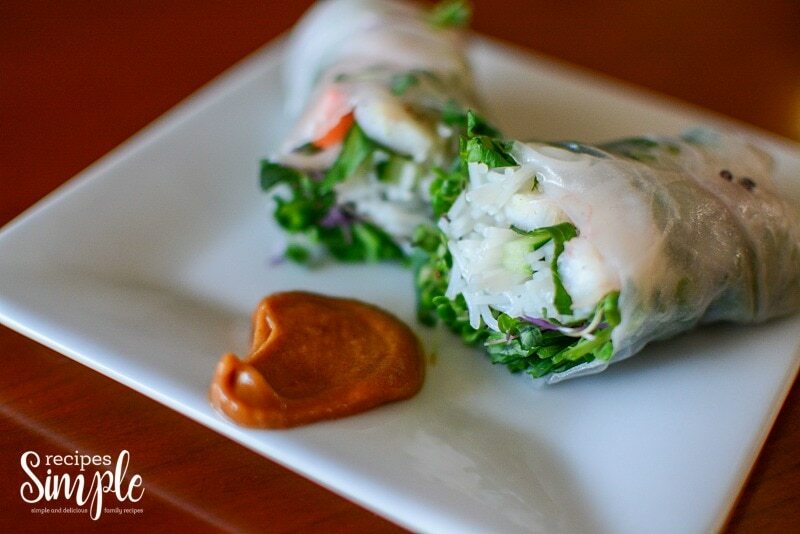 Scroll down for the printable recipe, to make these tasty rolls. 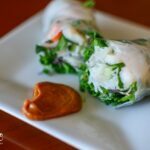 You would think to make these rolls was complicated, but truly you spend the most time cutting up the veggies, and then it takes just a minute to roll them up, and you are set. They are gorgeous for presentation and delicious for your taste buds. 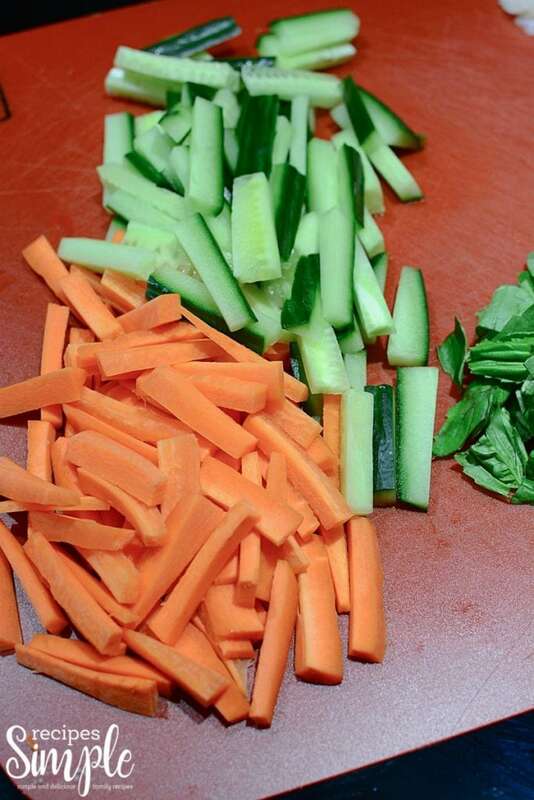 First off you want to take the time to dice up all your vegetables into small strips like in the picture above. While you are cutting cook your noodles as directed on the box and set aside. 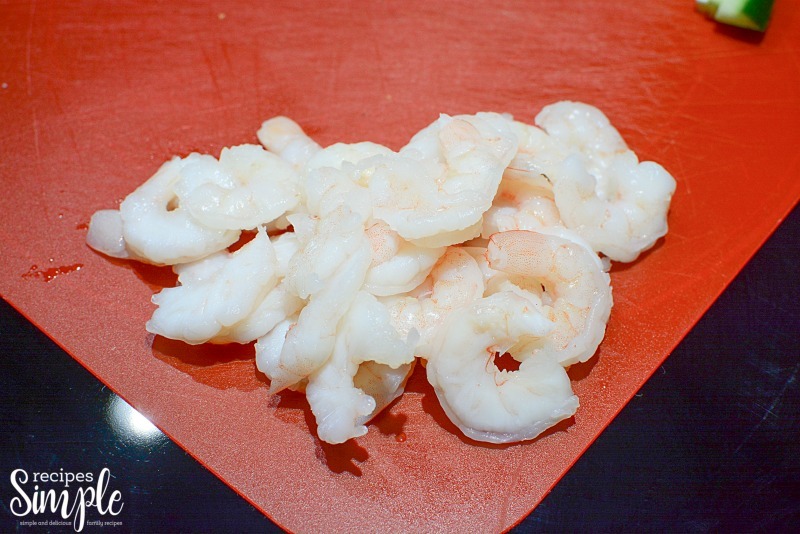 Next, clean up your shrimp, cut tails off, devein, or any cleaning that needs to be done and set aside as well. 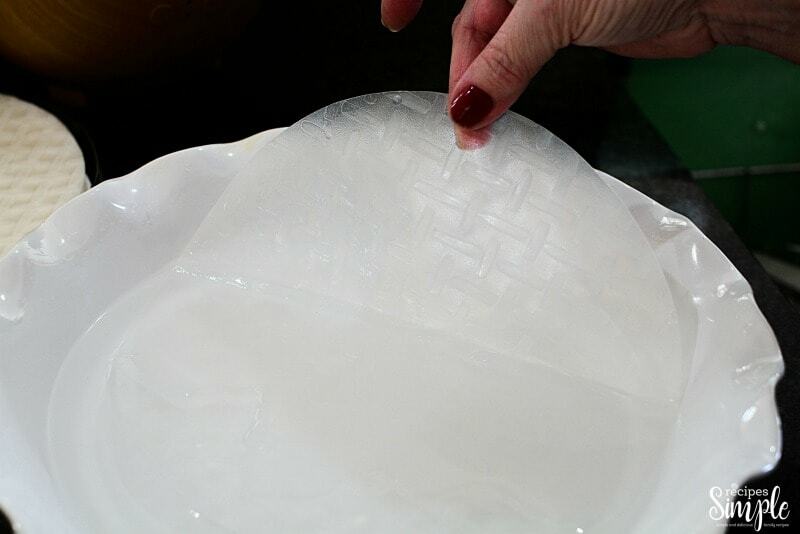 Then in a shallow bowl or container, add in some warm water and dip one salad roll sheet in at a time, and allow it to soften and become pliable. 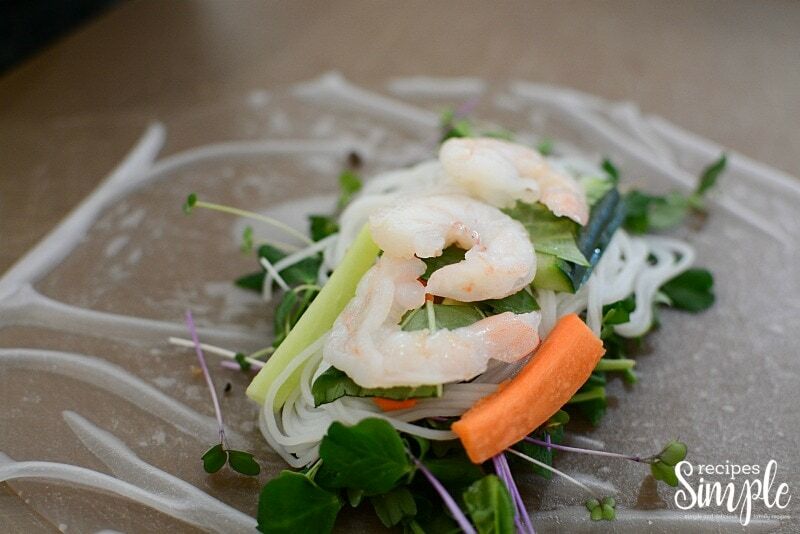 Take your sheet out once you can work with it, and start layering your microgreens, noodles, veggies, and topped with shrimp. Fold the two sides in, to help create a wrap to keep the filling in place. Slowly roll keeping the sheet tight and create a nice shrimp roll. Once done, set aside and repeat until all the rolls are made. For the sauce, you just want to mix all the ingredients together, and if it seems too thick add a little water. 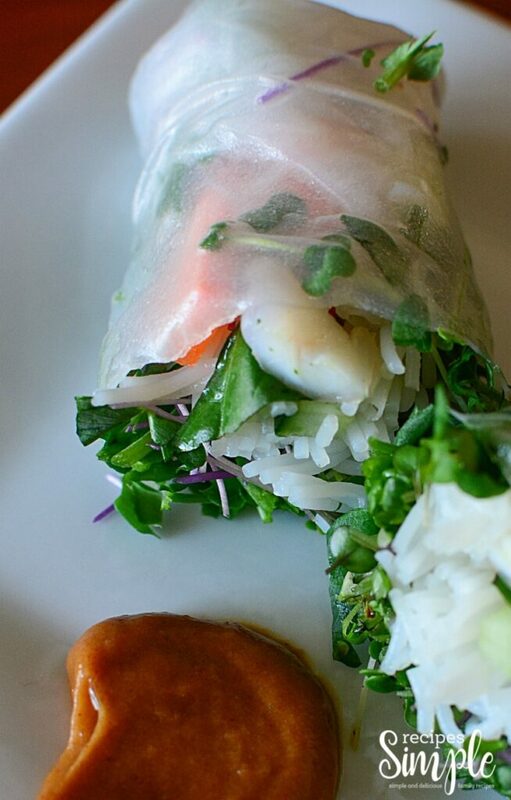 Serve on the side to go along with your shrimp salad rolls. Cut up and prep all the vegetables and microgreens and set aside. Do the same with the shrimp. In a shallow large bowl, place some warm water deep enough to accommodate the circumference of the salad roll sheets and to cover them. Dip the sheets, one at a time, (only work on one roll at a time), till the sheet begins to soften, and is pliable. Place the sheet on a dampened cutting board or wet clean towel. Take a small amount of the microgreens onto the center of the rolls. Place another small amount of noodles on top of the greens, and then place a few cucumbers and carrot sticks on top of the noodles, then placing some of the basil leaves on top of that. Lastly, place 2-3 halved shrimp on top of the vegetables. 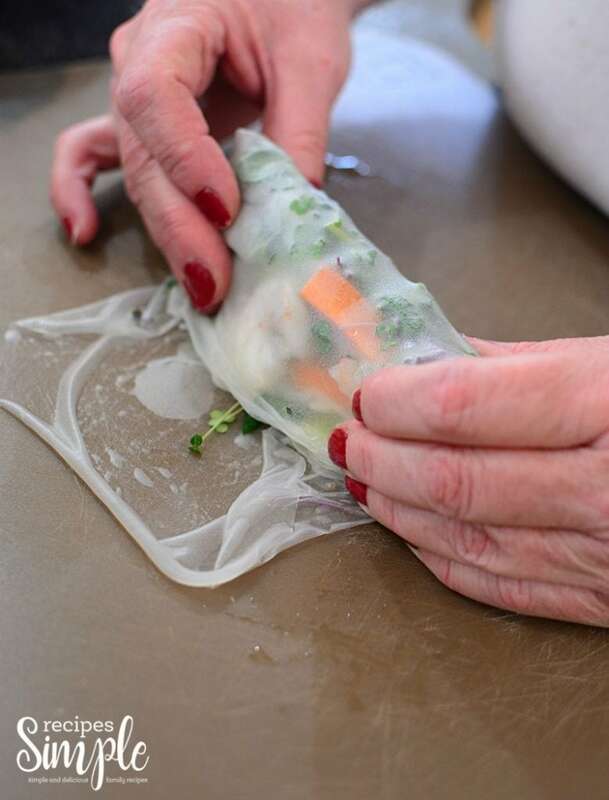 When rolling, fold in the two sides of the rice paper to the center of the roll. Then fold the bottom into the center tightly as possible without ripping the sheet. 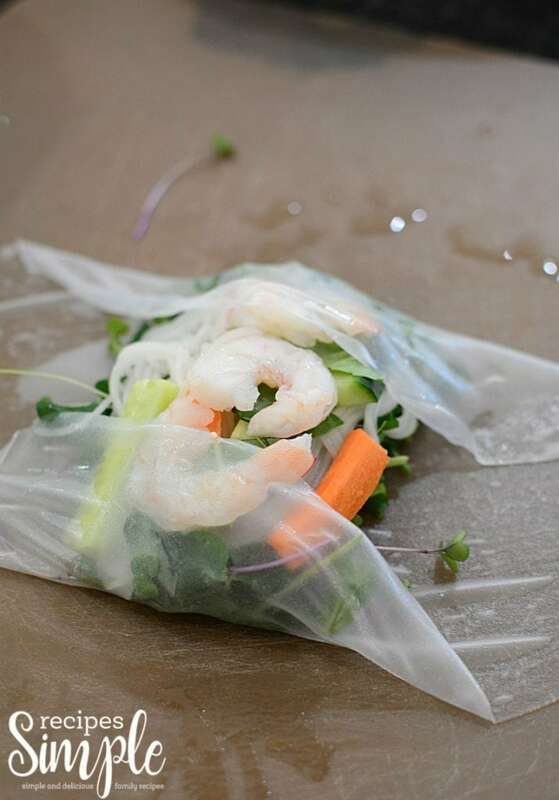 Pull the whole package slightly towards you to gather all the ingredients together, and then finish rolling upwards to the last remaining portion of the rice paper. Simply add all the ingredients together. 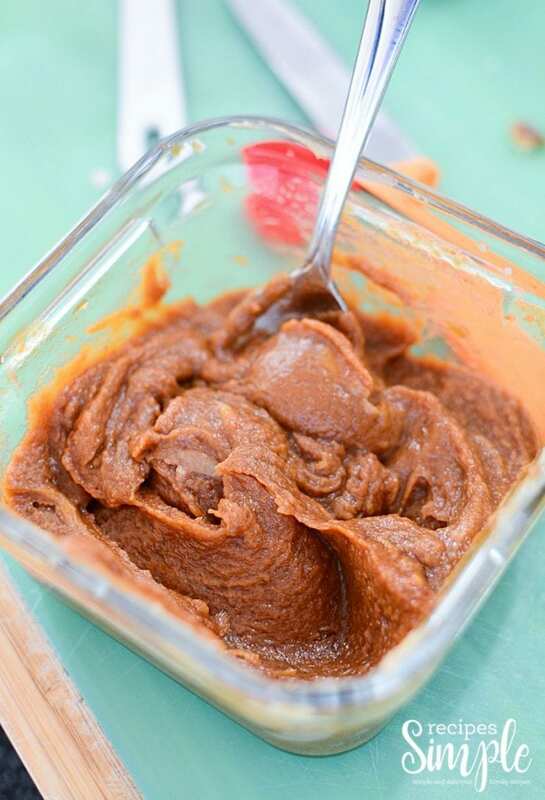 You may want to add more water as you stir to achieve the consistency that you prefer for a dipping sauce. The measurements of the salad roll ingredients are approximate. If you prefer more cucumber or more shrimp, use more. Less carrot or more basil, simply adjust to your taste preferences. This recipe will make approximately 15- 18 rolls, depending on how much you put into each roll.